Kids at the wedding. We’ve done pros and cons before ((👇 that related content)), but today we’re going to get into it, as if it wasn’t even a question of yay or nay. 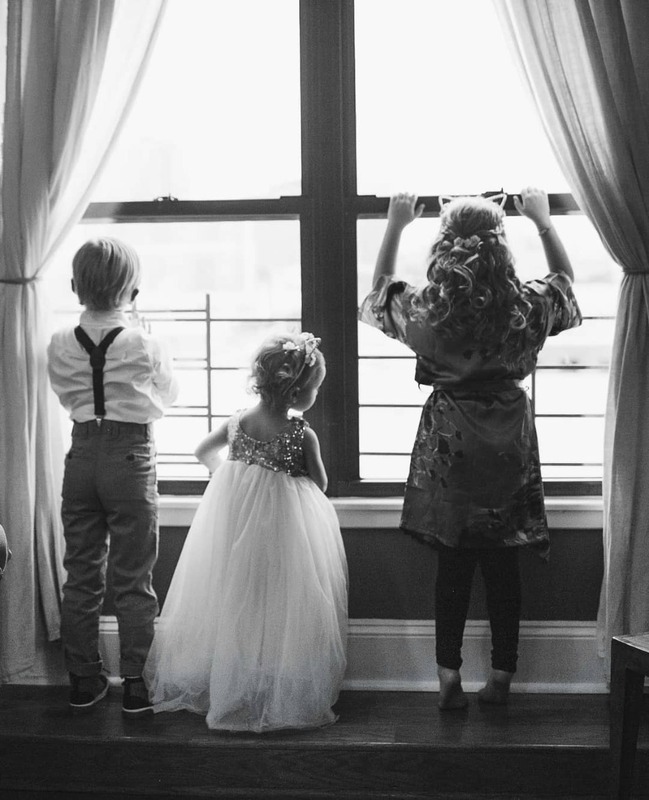 Bridal parties balanced out with a few ring bearers or flower girls, are just the best. Right, Sabrina Bryan??!? In any case, I’m writing with some experience today, because this past weekend was my sister’s wedding. It was great, we all had a wonderful day, she looked stunning, my MOH speech went well, good stuff all around. But by the time my husband, our son, and I got home after their post-wedding brunch, we all were wipeeeeed out beyond belief. So much so, that we had to tag team massage appointments yesterday, just to make sure we each had at least 45 minutes of pure, uninterrupted ‘ME’ time. 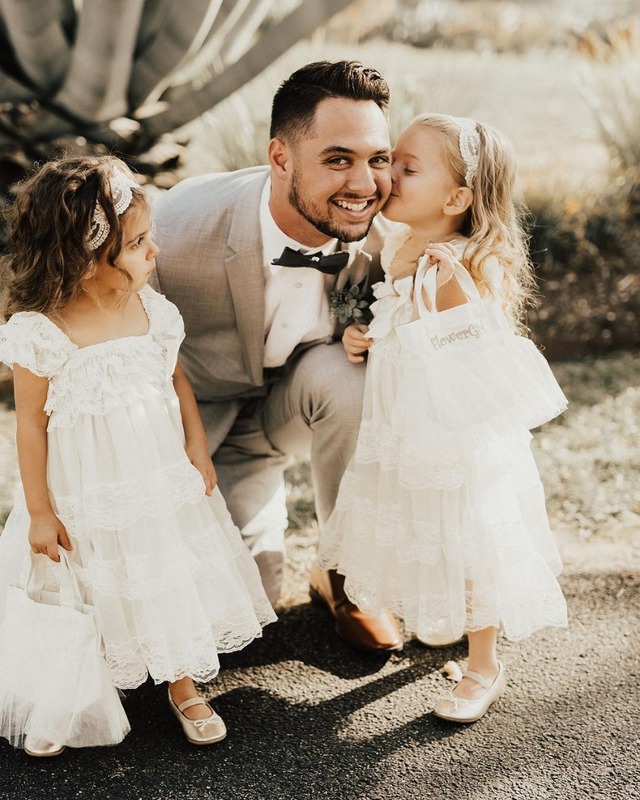 A nearly-20-month-old ring bearer to wrangle, whilst I handled MOH responsibilities and my husband played groomsman and wedding officiant didn’t exactly make for the easiest weekend of our lives. But he was sooooo GD adorable, so obvi we needed to make it work. And we certainly weren’t the first parents to deal with kid-related wedding day stress and definitely won’t be the last, so I wanted to put together just a few tips for couples getting married and parents of kids in the bridal party - and let you know that it’s totally possible to make it out of the wedding without having to hit the open bar a little too hard ((ifffff you have babysitters on hand to help, that is! )), you just have to be prepared!! You’re parents, right? Pretty sure 'being prepared' is your M.O. for the foreseeable future…. Try to keep to your routine as much as possible. One of the biggest mistakes naive and unpracticed parents (ahem, myself, still only 20 months into this parent game) can make is just to assume that it’s only ‘one or two days,’ if he or she doesn’t nap or go to bed on time, it’s okay. We’ll make up for it in the days following. Ummmm, this is the worst kind of thinking. Because, yes, it’s only a weekend, but kids - especially babies - need to be kept on a schedule, or else chaos ensues. So, try to keep their days as close to normal as possible. For me, that meant leaving my little guy at home with daddy so I didn’t have to rush him awake to make it to hair and makeup on time. My husband was there to get him up, cook him a great breakfast, and let him stay and play in PJs for a while without feeling like he was getting dragged around - somewhere out of his comfort zone, no less. 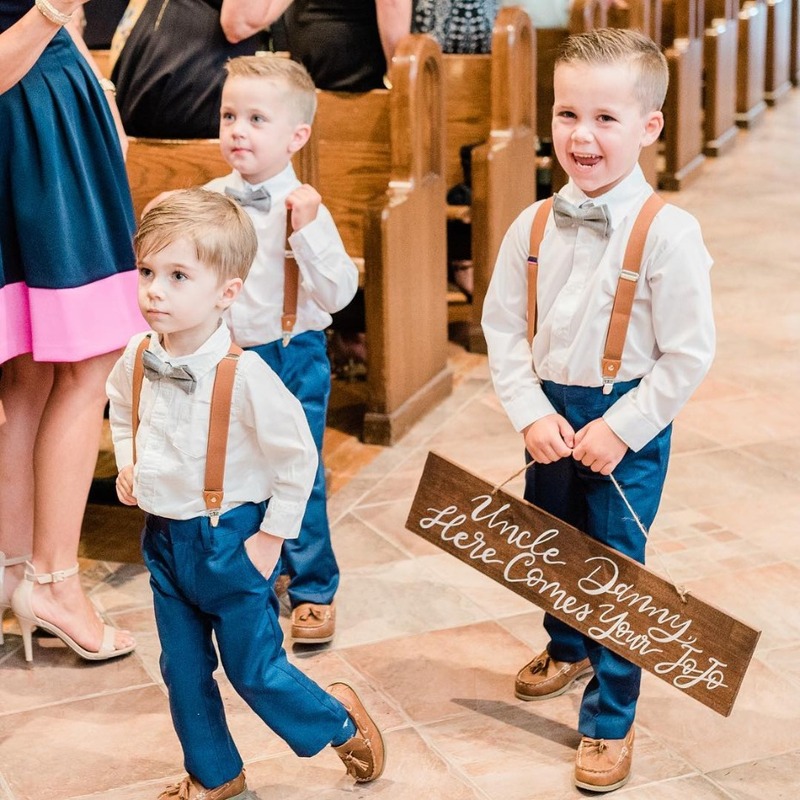 If this means talking to the bride to see if the ring bearer or flower girl can miss the first round of ‘getting ready’ pics or hold off on the snaps until after his or her midday nap ((napping during a wedding, kids don’t get FOMO, you’ll be fineeee - yep, that’s what my son was laughing at on Friday, after he refused to take a nap all. day. long. )), then definitely make that ask! Remember they need snacks and sips, too. My son got to hang with daddy all morning, but my sister’s flower girl - and my baby’s counterpart - came with her mama to the bridal suite. Full transparency, this little peanut is one of the chillest babies I HAVE EVER MET, so this might not apply to all. But as long as she was able to snack on some healthy (and not so healthy, babies eating bagels, #allofus) nibbles and drink her milk, she was good to go!! 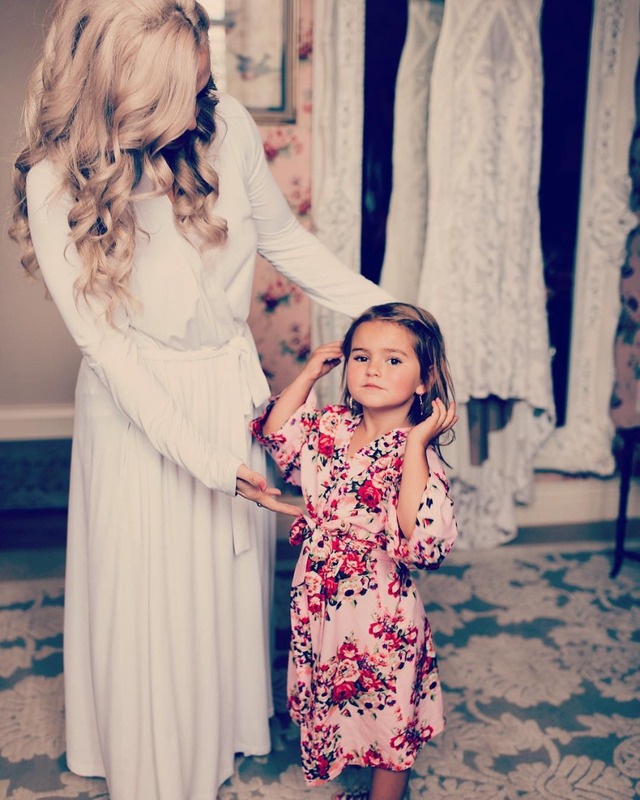 Again, this might be something to chat with the bride about a few weeks before the wedding, but a surefire way to keep tantrums to a min: baby/kid-friendly bites and bevs in the bridal suites. Bring distractions, lots of them. Because we knew Friday (the day of the wedding) would be a total s***show, we got most of our prep work done on Thursday, before my sister’s rehearsal dinner. Putting together a to-do/to-pack list is paramount. Literally paramount. So, in addition to bringing two or three outfits for my son to wear at various points in the weekend, we also brought a bunch of his favorite books and easily-portable playthings. We also asked my sister if she could hold off on giving him his ring bearer gift until the morning of the wedding - which was a great decision, because surprise toys are always a fun and unexpected distraction. GAMECHANGER. Have a bunch of flower girls in your group? 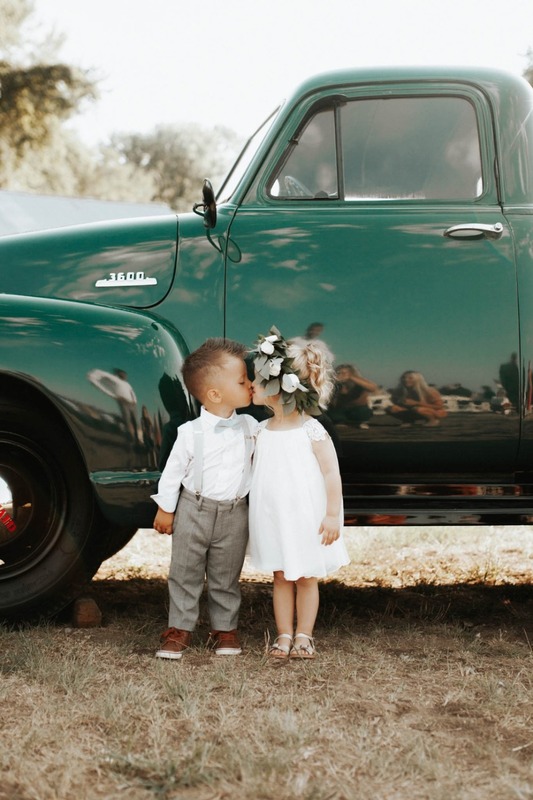 Peep some of these awesome flower girl present ideas! Be okay with abandoning plan A. Yes. Plan A is always preferred. Those perfectly-staged pictures of the kids smiling and looking angelic, yes, great. Everyone coming down the aisle with their signs (aka ‘Uncle Mike here comes the love of your life’) legible, straight, etc. or sitting patiently in the wagon, tossing flower petals out the side, while the crowd collectively ‘Awwwwws!’ Also great. No one screaming during the ceremony or needing to be held by at least 3 people AT THE ALTAR. Of course, muchhh preferred. Kids; however, are unpredictable AF. They don’t really care about your plan(s), in fact, they might very well 💩 on it/them. But, you don’t have to make a big deal about it. 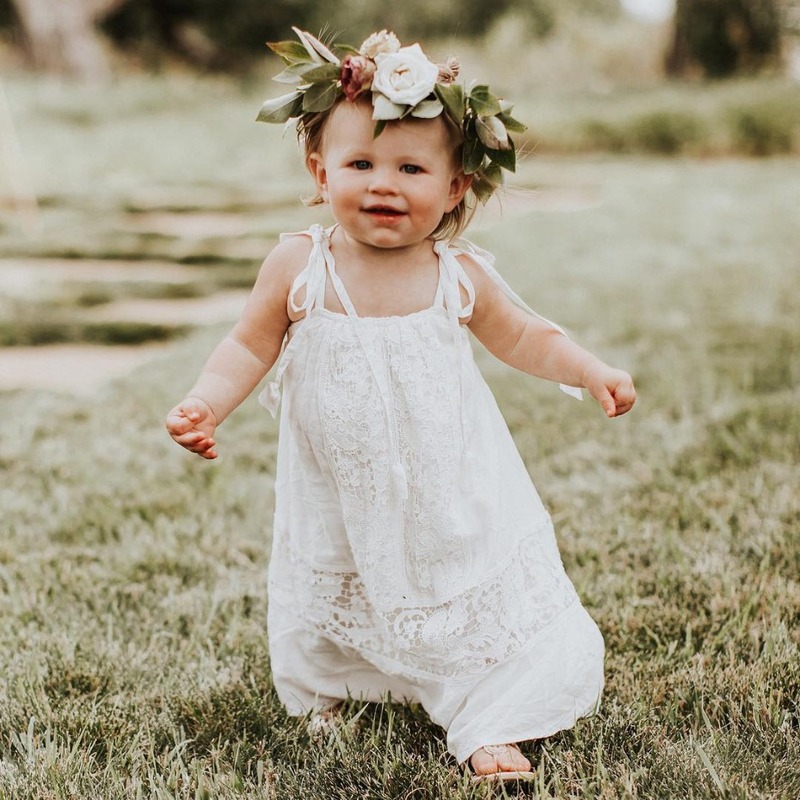 Yes, the bride absolutely doesn’t want spilled juice on her dress, but if it’s on her flower girl’s dress or lollipop stains all down the Matron of Honor’s gown, at least it’s not her. If all the formal pictures have been taken by the time all hell breaks loose, then so what? Stained ensems don’t matter any more. And if the Matron of Honor has to hold the ring bearer, while the bridesmaid 2nd-in-command takes over on dress and bride’s bouquet duty, then so be it. Everyone just needs to lower expectations when kids are involved. Point blank. Make the minis comfortable, no matter what. Couples can certainly run the show when it comes to having kid-friendly dinner options offered at the reception, a designated kids table, or high chairs and/or booster seats readily accessible for parents who need them, but parents know their children best, so they need to step up to ensure their tiny ones are on their best behavior. Whether that means scoping out a private, slightly less overwhelming spot during cocktail hour to sit down, get some munchies into their mouths, or even sneak out to change their diaper or bring them to the bathroom. Or, making sure they’ve got noise-mellowing headphones on their ears before they’re whisked away into the reception - with the DJ spinning loudly or the band blasting bass all night. It also helps to let the pipsqueaks explore a little bit, if possible. My husband literally said that "If I had my way, I would have told my parents to let him just run crazy in the cocktail hour and ballroom for a few hours (when everything was being set up), so that once it was ‘showtime,’ he wasn’t trying to explore as much and might be tide over with that "quiet corner" of books and toys." #boyswillbeboys. The wedding vendors probably wouldn’t have liked that, at all, butttt some supervised exploration time might have helped get out some of my little man’s energy. Who knows! When things are going great and the kids are out on the dance floor, digging the songs, sounds, and sights, then you’re golden. But wedding days are long. By 9pm at night, even I was ready to go to sleep, and my son was crashing hardddd. Thankfully, we had his stroller, and could pop him in and buy us some more time with a few rounds around the venue, but that only lasted for so long. He ran out onto the dance floor in the middle of my sister and dad’s father-daughter dance (cute, but annoying) and he started running away from me and my husband into a sea of wedding guests - a little too many times. So, I made the executive decision to bring him back to the hotel and put him to bed. Thankfully, my in laws had been invited to the wedding, and were already exhausted enough to retire for the evening, so they filled in as babysitters and brought him back to the hotel to pass out peacefully in his pack-n-play. Point being: try, if you can, to have an emergency/contingency plan. Whether that means enlisting a babysitter for baby duty after the ceremony or cutting the evening short to tend to the littles, there’s always at least a few alternatives. In-laws are rock stars, and my mom will be helping us out the same way in January, when my husband, babes, and I are all in my cousin (and brother-in-law)’s wedding. Don’t be afraid to ask for reinforcements!! !